Raise up your hands who are in love with long skirts. As I thought. We all are in love with this beautiful garment. In today’s post, I want to share with you my favorite tips on how to wear long skirts this year. This chic staple is voguish and flattering to any body shape. You can wear them for any occasion. The key to this trend is to know the right length and shape of the skirt. I gathered helpful tips and tricks how to make them look and feel awesome. 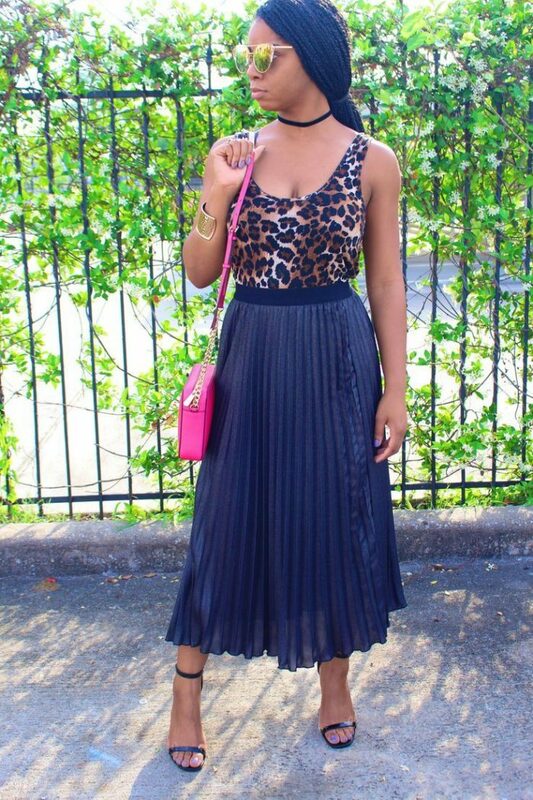 The first combo is crop top paired with a long skirt. This is a perfect contrasting combination. The crop top will exude allure and voguish look showing-off your midriff skin, while skirt gonna keeps your silhouette feminine and classy. You can wear your skirt low or high up to your waist. You gonna see two looks, where the first one features gold shiny glittering crop top teamed with a semi-sheer black long skirt and the other look features plain black crop top teamed with a bright blue high-waisted maxi skirt. Next look is the tunic paired with a maxi skirt. Let your tunic hang loosely over the long skirt creating that special laid-back look. If you want to define your curves, then I recommend to wear a knee-length pencil skirt with a peplum top or keep the top fitted and pair it with fitted peplum skirt. This combo will ideally work for those ladies who have a straight body shape. You can highlight your waist area: all you need is to wear loose-fit top and bottom and cinch the belt a few inches above your waist. I do love to see ladies wearing maxi skirts styled with bikini tops. This is a perfect look for long beach walks. Choose neutral color tops to pair with bold print skirts or neutral-colored bottoms with printed tops. You can do so many things with neutrals. You can create dress illusion thanks to a neutral or basic color fitted top. All you need is to pair the top with different color A-line or ball skirt. As a result, you gonna get a two-toned dress. The last but not least, you should never try gathered skirts if you are a curvy lady or have a tummy, otherwise, you just make everything look even worse. What a lovely look we have here! A lightweight black sweater is teamed with a blush long skirt and skinny black heeled sandals. By the way, I made an article about lightweight sweaters for women, check it out, as there are lots of interesting styles you can wear during cold Summer months. 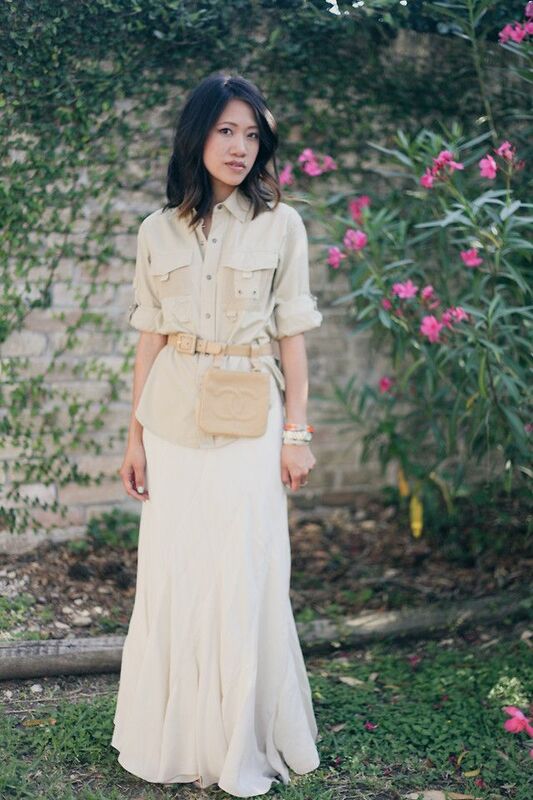 A sweet safari ladylike look! We see a cargo beige shirt teamed with white maxi skirt. The look is completed with a cream belt beg and arm party. By the way, I highly recommend to check out my post on women summer accessories that are easy to wear and combine with all your favorite clothes. Do You have any thoughts about How To Wear Long Skirts? Here are Fashion Tips pictures and trendy women’s outfits which are in style in 2019: Belts, Bikini Tops, Crop Tops, Long Skirts, Peplum Tops, Skirts Trends 2018, Tunics and tips on how to wear them on the streets.